As part of Open Studios 2015 we’re delighted to announce On Forward: a vibrant exhibition featuring new pieces from artists based within West Berkshire, who are relatively early in their careers. Striking out with passion, experimentation and youthful vigour – Open Studios provides these young artists, who may have no studio space of their own, with the opportunity to share their work. The exhibition is free and runs from Tuesday 5th May – Saturday 27th June. Monday-Friday 10am-4.20pm. For weekend opening times call 01635 244 246. Jimmy’s On Forward collection is a series of dynamically coloured portraits of women. Whether they are dancing, relaxing or posing – each possesses an undeniable intimacy. Jethro German’s work takes inspiration from a wide variety of sources, including televised sport, film tropes and news stories. In isolating particular aspects of these forms, German seeks to deconstruct and parody the framework by which we consume and process information, exposing the absurdities that pervade popular culture and the mass media. After pursuing studies in graphic design, photography, interior design and illustration, Jennifer draws her inspiration from personal experiences. Her work explores and expresses her emotions in an abstract way – showing what comes from life’s experiences through suggestive symbols. Jennifer works as a a Graphic Designer full time. Hester Kessling approaches her work meticulously, making use of homemade compasses and drawing devices to produce images of great detail. Hester replicates this approach even in her more thought provoking images, contrasting the examination of the interior psyche against the simplicity of overlying bold lines. Sister of Hester Kessling, Mirren Kessling is an artist who is currently studying at the Ruskin School of Art in Oxford. 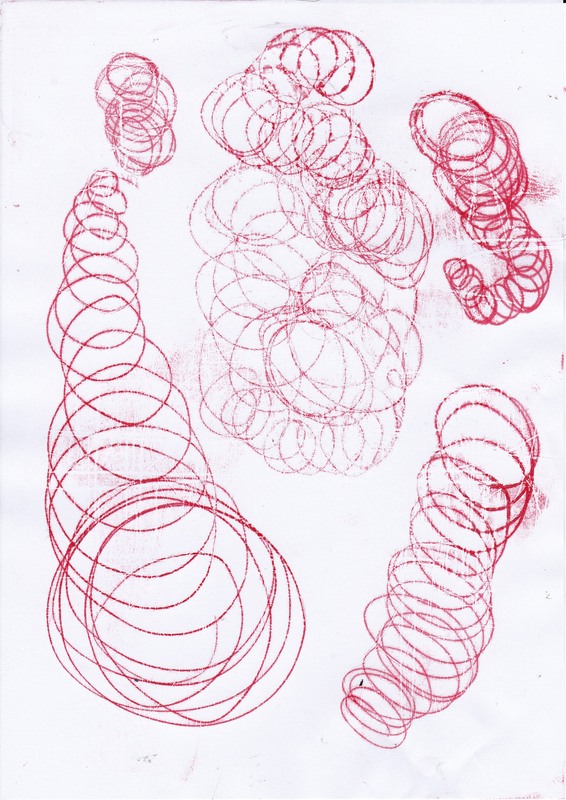 Her work is focused on printmaking, performance and the documentation of these two mediums as interconnected acts. Printing for Mirren has become not only an extension of her drawing but also a medium for documenting traces and marks left behind by the artists body, but also the act of printing as a performance worthy of documentation in film or photography. Doug Roberts is an artist primarily working to produce drawn and painted responses to nature and the built environment, currently living and working in Newbury, Berkshire. He has spent the last eight years working and studying in Brighton and Hove and has drawn inspiration mainly from the urban environment there. He graduated with a BA in Fine Art Painting from Northbrook College Sussex in 2008 and has since exhibited in the Nelson Gallery in central Brighton and the Candid Arts Gallery in Islington. Not the sister of Douglas, Francesca’s oil-on-paper work explores landscapes/seascapes and emotion. To over simplify – Francesca translates emotions into landscapes that are at once alien, and all too familiar. A selection of Mary Hare A Level students share their A Level projects.